I visited Hamilton Grange, which was the 19th century home of Alexander Hamilton in northern Manhattan where the island narrows and the terrain slopes steeply down to each river. High above St. Nicholas Park, where the home is now located, looms a neo-Gothic fortress. It is the City College campus, also known as CCNY, perched on top of the schist boulders that form the island’s bedrock spine. Along with Hunter College and Brooklyn College, CCNY is one of 11 senior colleges that comprise the City University of New York system. I flashed back to Ted K., an educator who started his career in the city of Mount Vernon, where I grew up. We met in the 1990s when he was an administrator in the school district where my family lived. Somehow things always do get around to Mount Vernon. But first he talked about being a student at CCNY in the early 1950s. To make extra money, he worked part-time in one of the college offices where he occasionally walked by an open file drawer that contained student records. He noticed that some of the folders had red dots on them. Sure enough, the marks indicated students who were thought to be affiliated with the Communist Party. Ted described how the realization that the administration was monitoring students’ activities truly shocked him. But he needed the job and kept his mouth shut. He went on to get a Master’s that brought him into the field of high school counseling. He took a position at A.B. Davis High School, the precursor to Mount Vernon’s sprawling new high school which would be built on the north side of the city during the early 1960s. Ted worked under the wing of Grace T. Lewis, dean of A.B. Davis. A descendant of Meriwether Lewis and daughter of a banker who served as mayor of Mount Vernon for two glorious years, Lewis still wore pince-nez and devoted herself to shepherding students toward college. Things had changed a great deal – yet, in a way very little – since Dean Lewis arrived around 1920. At that time, the students at Davis were largely Protestant and Jewish and would complete the college preparatory course. 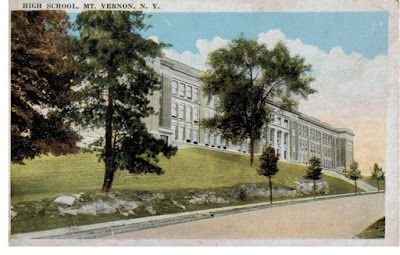 The city had another high school: Edison Vocational and Technical High School, attended by black and working class students. Students were steered one way or the other. Years ago, I interviewed a retired teacher who joined the high school faculty in the mid-1930s. “People would ask me whether I taught in the temple on the hill or the spaghetti factory in the valley,” she said. It took nearly a decade to pass the referendum to build a new high school because of opposition to black students being bused across town from the south side. But eventually the progressives won. The new school was state of the art. Harvard president James B. Conant had recently proposed remaking secondary education with a consolidated curriculum, and Mount Vernon built the classic comprehensive high school with vocational courses such as business, auto body, and cosmetology. Ted K. became principal of Mount Vernon’s most prestigious elementary school. After a few more years, he confronted the superintendent about patronage and racism in the district and was punished with a demotion. After that, he’d had enough and moved on. Wouldn't it be interesting to go back in time and teach at either school for a day? Yes -- time travel. I hope they invent it soon.